Good move Spennymoor. Anderson hits a 60yd raking pass and the set from Taylor is fired over by Henry. Taylor did well to maintain his footing there even though it was a tap in. The pitch is heavy to say the least! The @granthamtownfc fans are a passionate lot behind Dan Lowson's goal - good to see, it's a good atmosphere in The Brewery Field today. ... not that they're affecting Mr Lowson. His distribution has been quality as usual. After Moors' razor sharp start, Grantham have grown into it. Ellis Storey is very lucky to escape a booking after a studs-up challenge on Henry. Good job Shane's made of stern stuff! Henry breaks up a Grantham break with another strong challenge. The Gingerbreads are bouncing off him at the moment. Galinski concedes a second free kick for another barge in the back. Not sure what he's trying to do here. He'll be booked if he persists. Lee Shaw wants a penalty but it didn't look like Curtis actually challenged him, he was just jockeying. More of a slip. Moors finish the half with a chance for Armstrong as he races clear but is forced into hitting if early. Easy for Preston. HT 1-0! Grantham are pressing the Moors backline now. Lowson as yet untroubled. Oooooohhh just over from a Ramshaw rasper. Ohhh dear. Hollingsworth has gone over an imaginary leg in the box and mr Whatling falls for it. Penalty to Grantham. GOAL Spennymoor 1-1 Grantham - Luke Shaw. Not even sure who is supposed to have challenged Hollingsworth - but Tait booked for dissent. GOAL Spennymoor 1-2 Grantham. Like Shaw again. Dasaolu fires a wicked ball in. Lee Shaw's shot blocked point blank, Luke shaw turns in. Grantham have shown much more this half. Moors looking to lift it as Armstrong lifts one just over. Moors players and fans contesting every refereeing judgement at the moment. Jason looking to liven it up as White replaces Anderson in midfield. Mr Whatling is not very popular with Moors fans today. Failed to penalise Wildin for launching the ball away after play stopped. All quality has gone out of the game. Moors feel aggrieved and are struggling to regain control. Grantham are using every trick in the book. Unlucky!! Great Watson cross is met by Taylor, Preston tips wide. Nothing falling for Moors at the moment. They need a lift from somewhere. The pitch has cut up badly now, making it hard to strike the ball cleanly - plenty of mis-kicks. 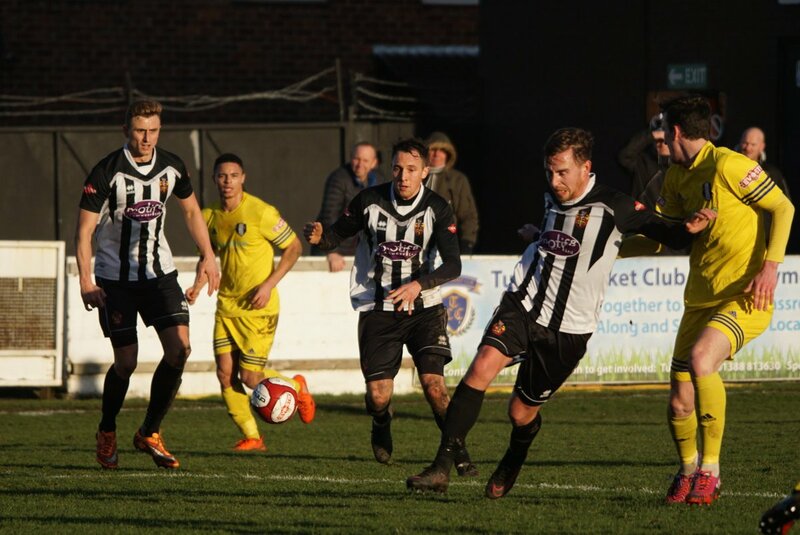 Big chance for Moors! Ramshaw wriggles free on the right. He smashes it across goal from the byline... in between the three Moors men. Tait saves Spennymoor. Harry Clifton picks up a Lowson clearance and has a man free at the back post for a tap in. Tait with a huge block. Chance for Moors - Taylor smashes goalwards at the back post from a corner. Blocked. Moors back on top, but is it too late? Full Time Spennymoor 1-2 Grantham. The Gingerbreads continue their charge up the table at the expense of Moors, who didn't deserve to lose.